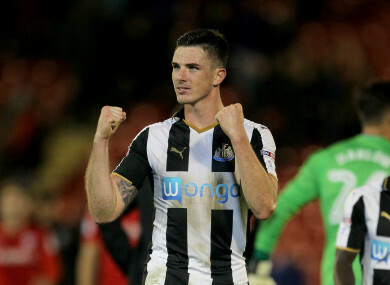 Ciaran Clark scored as the Magpies prevailed comfortably against West Ham. NEWCASTLE UNITED AND Swansea City both picked up their first wins of the Premier League campaign with victories over West Ham United and Crystal Palace respectively. With Huddersfield Town dropping points in a 0-0 draw with Southampton and West Bromwich Albion in action on Sunday, Manchester United can go clear at the summit by beating Leicester City later on Saturday. Rafael Benitez’s Newcastle got off the mark at the third attempt after goals from new signing Joselu, Ciaran Clark and Aleksandar Mitrovic secured a 3-0 home win over West Ham, who remain without a point. Frank de Boer is still waiting for his first point — and goal — as Palace manager after a 2-0 loss at home to Swansea, who prevailed courtesy of goals from Chelsea loanee Tammy Abraham and Jordan Ayew. Watford’s Miguel Britos was sent off for an awful studs-up foul on Anthony Knockaert in a 0-0 draw against Brighton and Hove Albion at Vicarage Road. Email “Irish international on target as Newcastle pick up first win of season”. Feedback on “Irish international on target as Newcastle pick up first win of season”.